Meet Molly Lou Melon. She has buck teeth. She is short. She has a voice that sounds like “a frog being squeezed by a boa constrictor.” But what little Miss Melon lacks in beauty and grace, she more than makes up for in charisma – lovingly nurtured and supported by her beloved grandmother who tells her to stand up tall and shine her light for the world. Molly Lou lives her grandmother’s words..that is until she moves to a new town and a new school and must encounter the penultimate bully, Ronald Durkin. 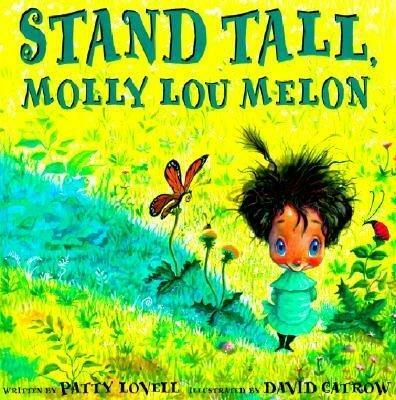 But what Ronald Durkin doesn’t know is that little Molly Lou, with her bushy hair and her buck teeth and her enormous buggy eyes, is a force to be reckoned with and a voice that will, in the words of her grandmother, “sing out clear.” Patty Lovell and David Catrow have given us a gorgeous book and an important one for all of the Molly Lou Melons and Ronald Durkins of the world.